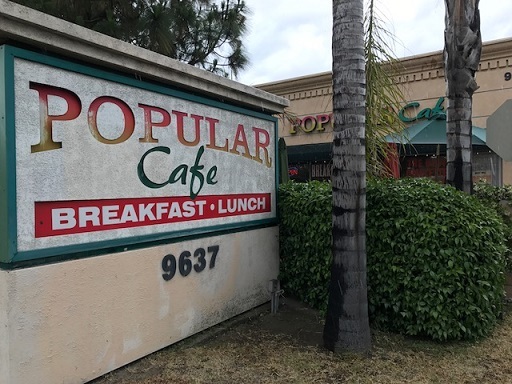 Popular Cafe, 9637 Central Ave. (at San Bernardino), Montclair; open daily 7 a.m. to 3 p.m.
For years I drove past the sign for Popular Cafe and chuckled at the immodest but charming name without ever really considering going in. Last spring a source who’s a regular suggested meeting there for a lunch interview. Well, why not? After the bland exterior, the inside has some homey touches: a hutch behind the greeter station, kitchen-style cabinets visible in the kitchen. It’s family owned by a Chinese American couple, with the wife waiting tables and the husband cooking the food, at least on my visit. Serving breakfast and lunch only, Popular Cafe has been around for some 25 years — see, it must be popular — starting off down the street and later relocating a few blocks north. The couple’s children, I’m told, used to help set tables when they were shorter than the tables. Awww. I had the meatloaf sandwich ($7.29), which came with lettuce, tomato and mayo, and got slaw as my side. 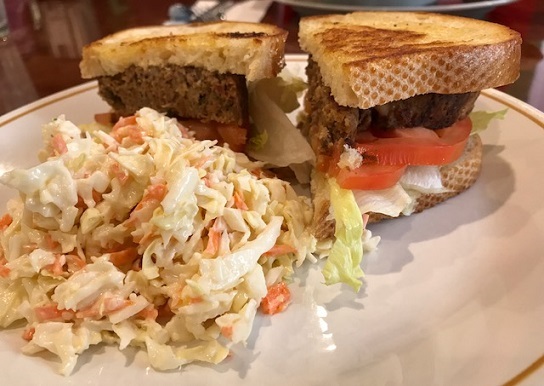 Not a lot of places have meatloaf sandwiches (sigh), and even fewer serve it as an actual sandwich rather than open-faced with gravy and mashed potatoes. But not only does Popular Cafe get points for trying, they get points for succeeding, as this was a solid version. Three months later, I went back for another lunch. They’re known for omelets and pancakes and I believe serve breakfast all day. (Why not, when it’s essentially a two-person operation? There’s not a lot of red tape to cut through.) 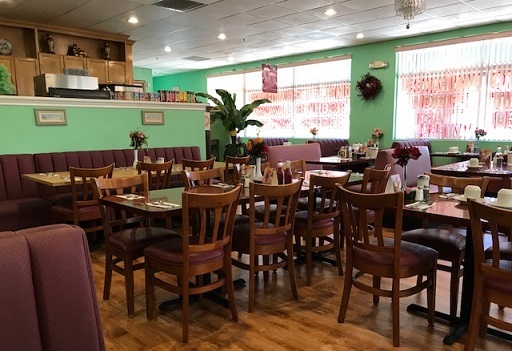 For lunch they have hot and cold sandwiches and some $7 lunch specials, including a few Chinese American dishes like kung pao chicken and egg foo young. 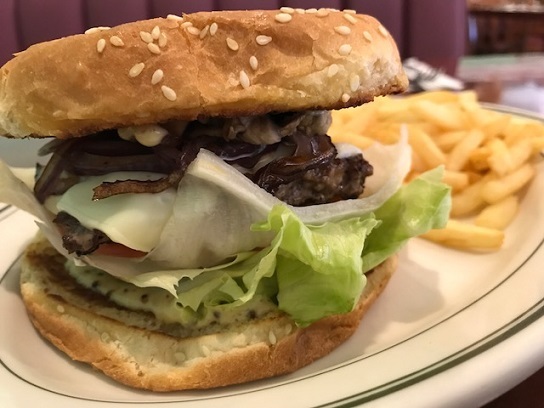 I got the mushroom swiss burger ($8), lured by the menu’s promise of a hand-formed patty. Indeed, it was a better than average burger. The bun, however, wasn’t quite up to the job of holding everything together. A sturdier bun is recommended. So, this is a decent option for all-American food. My second lunch came on a slow day in which I was the only customer the whole hour. C’mon, people, it’s the Popular Cafe. Don’t make liars out of them. This entry was posted in Restaurants: Montclair and tagged American, Montclair, restaurants by David Allen. Bookmark the permalink. We’ve been for breakfast a few times, and while better than Denny’s or IHOP…it’s not a destination point for us, nor is the place that took over the place that took over Cafe Montclair. Service was good. Anna’s Cafe is what you mean. I haven’t tried it either. I cannot keep up with the establishments moving in and out of that place. I never got to the Peruvian place or the current place. Cafe Montclair was a good, fine dining establishment–but the local population was not into fine dining. Paradise Restaurant gave good bang for the buck-soup, salad, entre and dessert for about $10. We ate there weekly. I think its undoing was the Paradise Buffet moving in about a mile north–City should never have allowed that–I mean the name. Then I heard from a former waitress recently, that the original Paradise Restaurant in Yucaipa is gone now too–sad. I had been to the first one across the street in the Town Center and this one, but many years ago–we just don’t eat breakfast out that much–food was good. I had heard way back when the first one opened, that the proprietors were cooks from the Red Hill Cafe. I never knew if that were a true fact or not. Maybe you could ask when you are there next time. Are you done with your “go to” Tuna? Meatloaf and then a burger, quite the carnivore. Losing Brossart & Lainey the same week maybe threw you off. Next thing you know you’ll have a Trump steak well done! Right SAWZ! I will never be done with the tuna melt. Never! But I admit I was distracted by the rare sighting of a meatloaf sandwich, and then the surprising number of burgers.